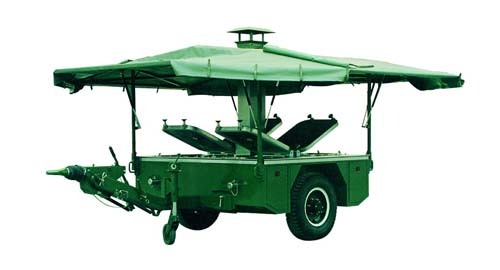 DES-250T is designed to cook for 250 persons of military troops, construction teams and civilians under field conditions. It is equipped with two kettles, two frying pans, two diesel furnaces and other 35 pieces of small kitchen utensils and tools necessary for operation. Diesel oil, wood, coal or natural gas can be used to heat the furnace. The kitchen can be towed under field conditions by trucks or cars. Covers of the side cases are made of acid-resistant steel, thus allowing various operations while preparing the meals. Standard equipments of the kitchen includes a tent enabling operation of the kitchen under any weather conditions and protecting the kitchen and the operating personnel. 6. Depth of ford: 500mm. 7. Operated by four cooks, they can prepare the meals of 250 person-share dishes within two hours. (2) Below wind force scale 7. (3) Weather: sunny, overcast, rainy and snowy.